While the health effects of many aspects of life, from diet to marital status, have been extensively explored, little study has been made of the health effects of work. 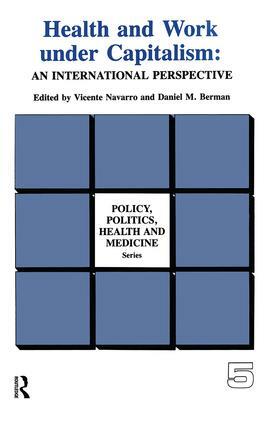 Covering such topics as on-the-job dangers, the role of unions in worker protection, and occupational health in both developed and developing countries, this collection of articles conclusively demonstrates the negative impact that neglect of citizens' working lives has on pubic health. With more Americans dying each year from job-related causes than were killed in a decade of combat in Vietnam, "Health and Work Under Capitalism" is a long-overdue and unusually significant book.